I’m a keen juggler. I’ve been juggling since I went to university, oh *mumble* years ago. Over the years I’ve practiced on and off, and have got to the point where I can do a convincing three-ball juggling routine fairly smoothly. I’ve heard it said that juggling 3 balls, on a scale of 1 to 10, is about a two, maybe three. Juggling four balls (which I can do, just about) comes in at about a seven. Juggling five? About a hundred. It’s that much more difficult – with three you’ve got a lot of time (no, really) between throws and catches. You can be a bit erratic (often for comic effect) and still keep the cascade going. 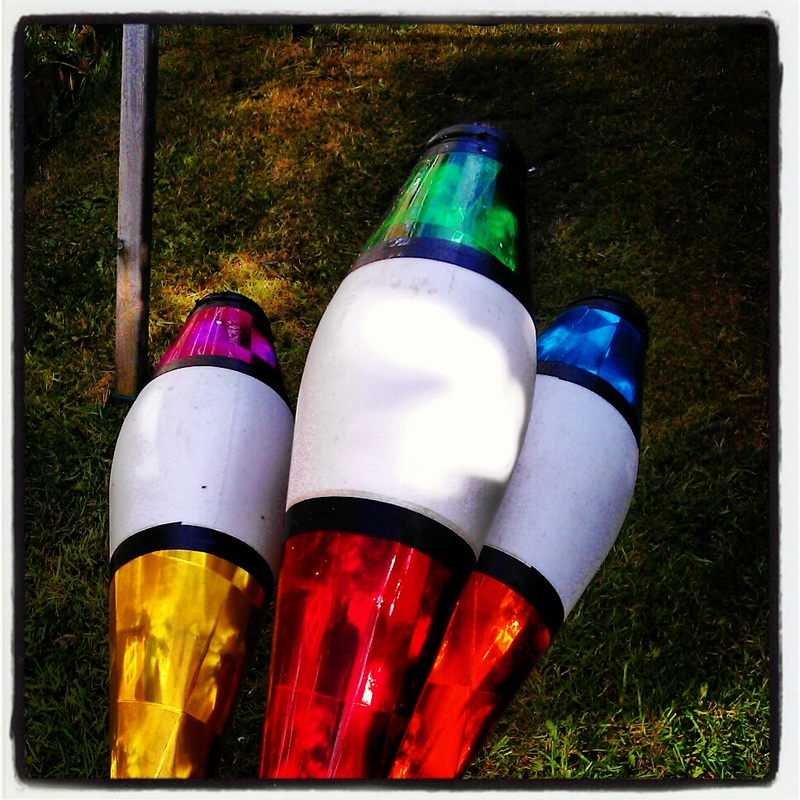 With four, you’re juggling a different pattern – two balls in each hand, and keeping them in synch. You can practice your weaker hand easily and it doesn’t take too long to get the hang of it. Five is a different beast. Same base pattern (the figure of eight cascade),but the balls are going higher and the speed notches up. You no longer have the luxury of time to correct any wonky throws with five – you’ve got three balls airborne to keep track of now, unlike juggling three where you’ve essentially got a ball in each hand and one in the air, most of the time. Starting with five is also harder as you’ve got three balls in your good hand and two in the other, and you’re trying to launch one of the three in a perfect arc, leaving the other two. 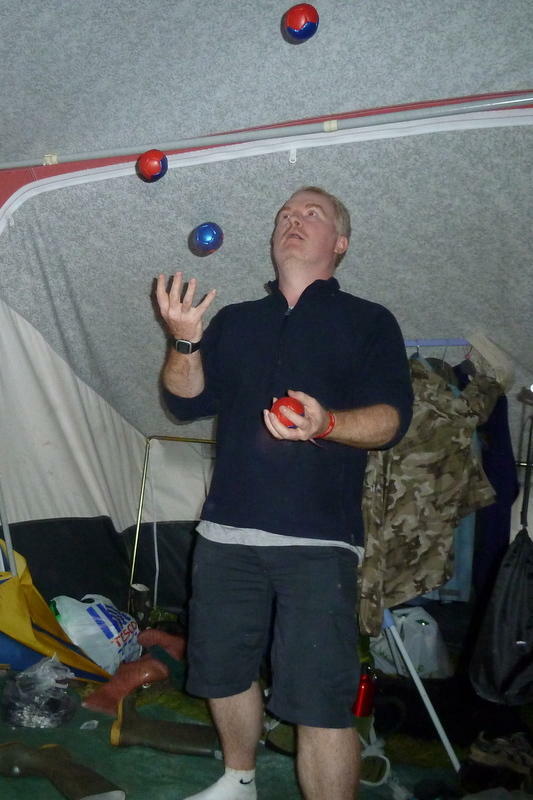 Five ball juggling often involves smaller balls! This year I’m determined to at least get a basic cascade going with five. I’ve finally been reacquainted with this beauty, which I got for my 21st birthday present. Yes, it was a long time ago. 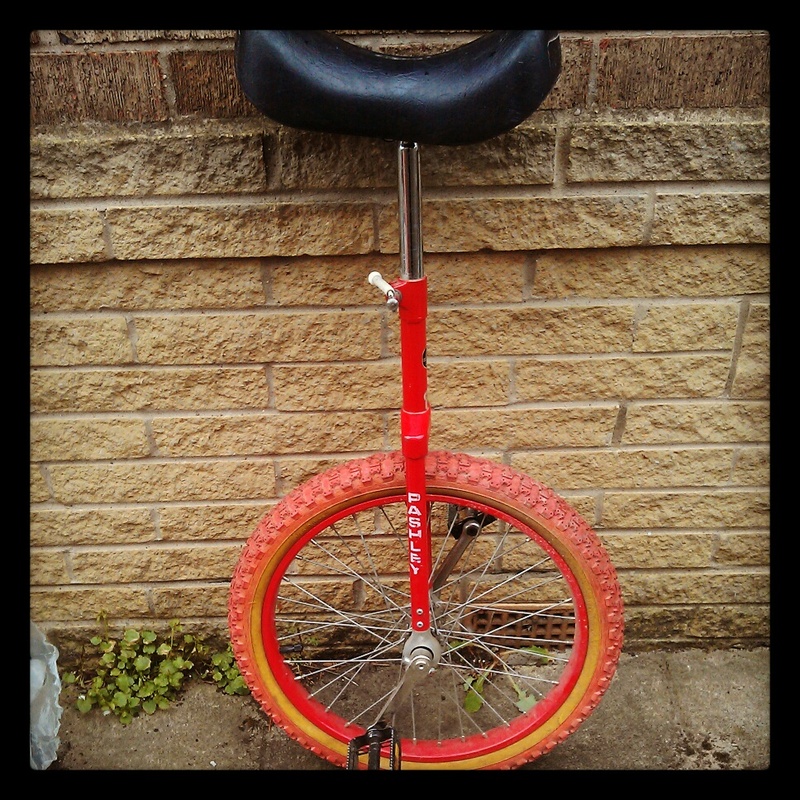 I fully intend to clean ‘er up and teach myself to not fall off. THIS YEAR. YT, juggling four. 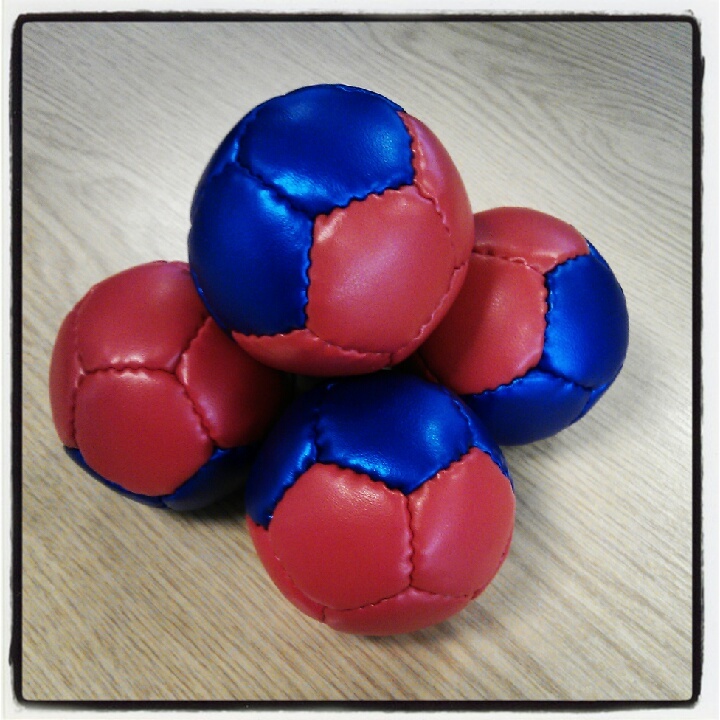 Juggling balls are hybrids, from the lovely folk at Tossaball Juggling. Tell them I sent you. 🙂 And yes, i’m juggling in a tent. Long story. Those clubs are teh shiny! As I can’t juggle two pieces of fruit; this sounds really intricate timing and focus. Please say that when you get to grips with juggling those you’ll consider doing a video, that would be brilliant to see. If I can persuade one of the kids to act as cameraman. Good luck with 5. I am trying for 5 myself and I can’t even flash 5. 3 is super easy and 4 I can do for a few minutes. Also working on behind the back throws. I’ve tried behind the back and just can’t seem to get it. Any advice? I can get five up and most of them back up again, but it all goes to pot! I need some smaller juggling balls for five, I think. Time to hit up my chums at Butterfingers. I was only able to do behind the back after doing under the leg competently. And I still struggle with behind the back, which may be due to lack of flexibility. It’s also a good idea to just throw the ball from behind the back in isolation without juggling any other balls. This may not help everyone but it worked for me. This may help your behind the back: Picture your hand as an elevator running straight up your spine. Instead of ‘throwing’ the ball behind your back, propel it up along your ‘spine elevator.’ It should then come right over your shoulder for you to catch. Hope this helps! Sounds like a great tip, I’ll give it a try. Thanks! Yeah, I guess putting in some solid practice just doing single throws to get my eye in would help. Cheers!